Putting a toddler in front of a refrigerator should make the appliance seem larger, right? In this 1956 image, it didn't quite work out that way, at least to my eye. 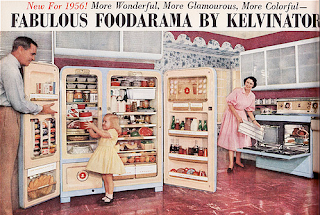 Scale notwithstanding, the Foodarama family is sure happy in their well-stocked kitchen—why, I bet if given a chance, they would burst into the catchy Kelvinator song [and maybe the dance, too]. I am happy for them. You should maybe be worried for them. The video is also interesting. A subconscious hook is set with the relative sizes of the refrigerator and the freezer. The "cold/moist" refrigerator is 11 cubic feet. The freezer holds 166 pounds. Quick, how many cubic feet in 166 pounds? These are incompatible measures, but who would question anything so sweetly told? Only your subconscious. Notice the words that immediately precede: "unheard of". You heard, you see, but didn't hear. Did you. "Kelvinator pioneered electric refrigeration for the home." They did not invent the refrigerator, because the refrigerator is a fridge and fridge makes us think of Frigidaire. They use the words "refrigerator" and "freezer" in the troubling context above and then replace them altogether. "Don't buy any food keeper," Hillary Brooke warns us — Food keeper? — "until you've seen the fabulous Foodarama by Kelvinator." Food-A-Rama. Kelvinator does not make refrigerators, they make things that are "most modern, most youthful, most new." Like little girls in cute little dresses. A dream come true. A setting for you. The kitchen is a place for "excitement." And in case your subconscious took one one hundredth of a second off, the Foodarama has "an un-refrigerated banana bin." The very next words, the very next words are "whatever the size of your…" Even the little animation at the start tells what Kelvinator has in mind. Gosh, I hope this post was as good for you as it was for me. Well...let me just say that I hope the next Flashback [tomorrow, already!] is just as enjoyable for all.